Here’s why you usually don’t see anything beyond mango sticky rice,* green tea ice cream, and fried bananas on the dessert menu of your favorite Asian restaurant. Desserts are not our forte. 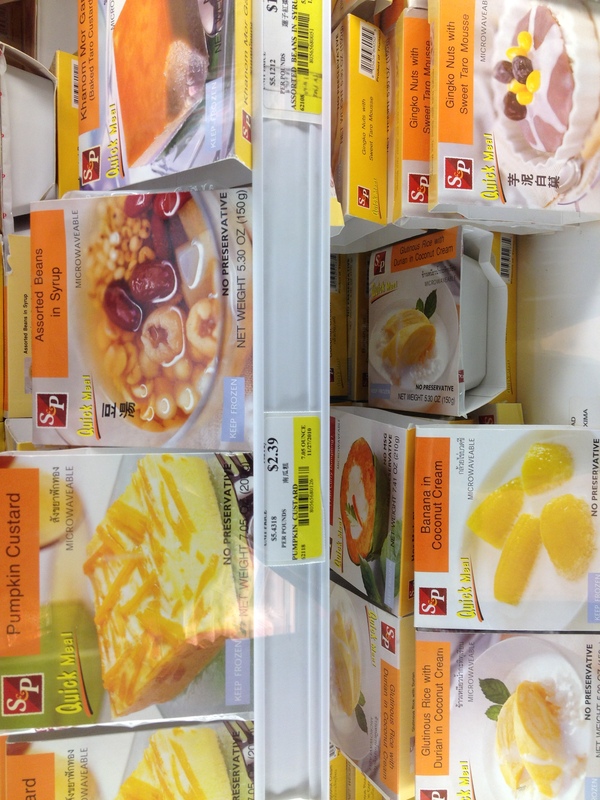 What follows are exhibits A, B, and C of the freezer case at Great Wall, an Asian grocery store in Falls Church, VA. A few observations below on what’s wrong with Asian desserts. (1) Fruit is not a dessert. Most Asians eat fruit for dessert. Which is a lot healthier, of course, but a few oranges wedges aren’t going to satisfy any craving for a cookie. 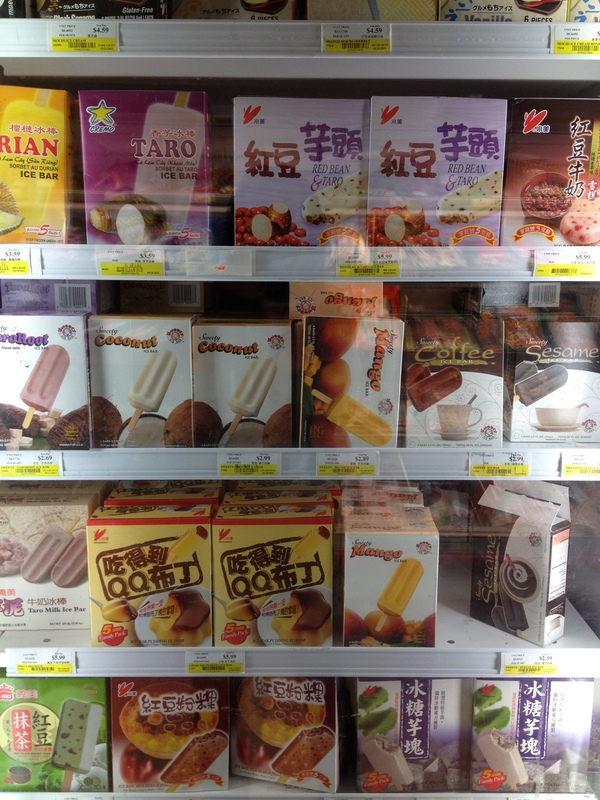 (2) Some Asian desserts are so bad, they border on the offensive. Mochi doesn’t taste like anything and it’s a digestion/choking hazard. No, I don’t want fibrous taro root in my cake. 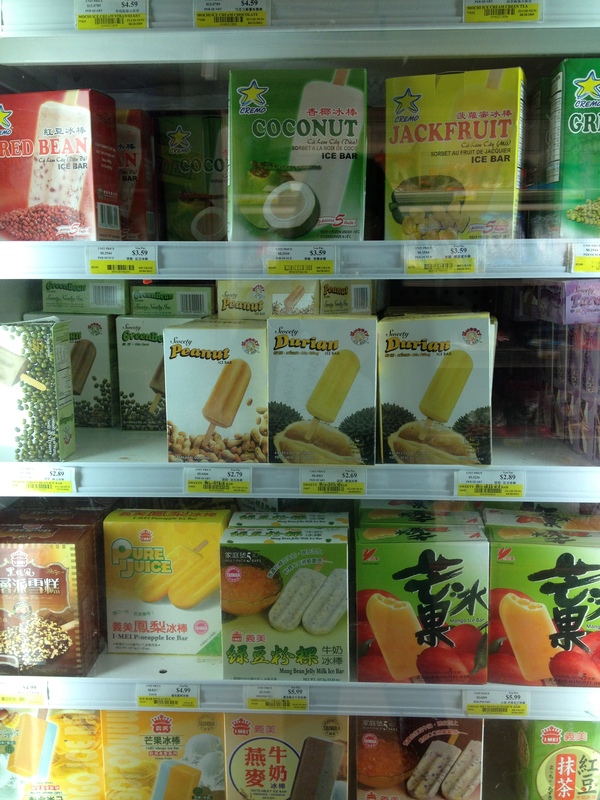 Please keep your durian out of my ice cream. There’s a reason some Asian countries ban that fruit from being taken on public transportation (it’s that pungent). (3) Care for a side of the toots with your sweets? Because many Asian desserts (mochi, red bean buns, moon cakes, shaved ice) come with beans as a topping or filling. Confusing and not delicious, right? *One of the lone beacons of light among Asian desserts is mango sticky rice (thank you, Thailand), which done properly can be divine. As can anything made with coconut milk. As long as it doesn’t also have taro root, beans, and/or durian in it. Um, the answer is no. Snow ice (or shaved ice) is a Taiwanese dessert: sweetened shaved ice topped with fruit, taro root (a potato-like vegetable with a creamy texture), chewy Bobas, and whatever else you can pile on. In fact, we have had difficulty identifying all the bits and bobs in our bowl of snow ice in the past. Pie V Cake’s guess is that if snow ice ever blows up, it will eventually go the way of Boba tea: trendy for a time, then relegated mainly to Asian eateries. It’s not like ice cream. Part of froyo’s success is that it’s a healthier alternative to a national favorite, ice cream. Snow ice is very…icy. Even with condensed milk in it, it still evokes a snow cone, which is something people typically don’t crave after puberty. Hold the beans. Snow ice toppings usually include beans. Not exactly a topping we associate with desserts in the U.S.
We have four seasons. Snow ice is popular in Asian countries because it helps people combat the heat (Taiwan has a subtropical climate). Very few regions of the U.S. get hot enough outside of summer to have a perpetual need for a dessert like this. While froyo sales slow down in the winter, snow ice sales probably fall off a cliff. Lack of portability. Snow ice is typically a huge mound of stuff. You can’t walk and eat it at the same time–although that would be a pretty awesome sight. Because the cooking isn’t heavy-handed at Makoto, even after 10 dishes, you don’t leave feeling sick. This grape-Grand Marnier shaved ice was the perfect ending to the meal.